Late in the eighth decade of the Universal Century, the Admiralty of the Earth Federation approached the Anaheim research division looking for a new high performance mobile weapon with which to replace the rapidly aging GM series. This request marked the beginning of several new development projects in a race to see who's design would prevail as the successor to the GM line and become the new frontline suit of the Federation. In the end, despite numerous new weapon types and high quality blueprints, the final two submissions selected for prototype construction and testing were the test bed for the new Jegan series and a revolutionary and little known design codenamed Kitsune. So named in homage to the Japanese animal spirit known for its shape-shifting abilities. Initially developed as a multi-role mobile weapon capable of being easily reconfigured in the field, the Kitsune was the most recent design to revisit the concept of a core/shell mecha once again. It had been demonstrated numerous times in combat by the legendary RX-78 during the One Year War, that the ability to quickly change machines during combat was a strategic godsend. It would be further explored and improved upon by several modular designs following the war, most famously by the Gundam Development Project's GP-01 prototype and the Axis' Zaku III. But while both of these designs significantly advanced the technologies behind the modular mobile weapon, the process involved was much too time consuming to make it practical in the field. Because of this the designers at Anaheim decided to try and combine the idea of the reconfigurable mecha, with the newer core flyer template that had been recently introduced in their ZZ Gundam design. The idea being to fly alternately configured modules out to the core unit during a battle, and then swap them out by ejecting the older components in favor of the new. This would also allow the pilot to discard damaged components in favor of fresh ones and thus increase the survivability of their unit. This plan went through several incarnations on paper, the final template calling for three separate modules aside from the core fighter: the chest flyer with reconfigurable forearm units, the leg flyer with modular calf pods, and the dorsal flyer with differing backpack configurations. Field trials of the newly constructed prototypes showed that the Kitsune had superior theoretical performance values to the Jegan, and even some of the mass production Zeta variants. It would seem that the designers had outdone themselves, but while the suit's numbers were truly something to be proud of, the data also revealed that this concept would prove too costly to fill the desired niche it had been commissioned for; as the required automated systems to achieve this without a second pilot, in addition to the modifications to the suit's frame necessary to make the design workable would also make it more expensive then anything currently deployed in the field. Because of this, the design was deemed infeasible, losing out to the Jegan and its counterparts despite the fact that its cost to performance ratio was superior to that of its competition. Thus the core plans were shelved until such time as the technology theoretically became more cost effective, or could be used to fill a role that was more open to the increased financial needs of the design. Despite the prototype being rejected by the Federation administration however, the engineers at Anaheim refused to let the ideas from this advanced MW concept die. The Kitsune's original purpose may have been rendered moot for the moment due to budgetary concerns, but they still felt that the design had much to offer if they could figure out alternative means of achieving their goals. Seeing as the suit's frame was still stronger then the one in use by most of the Federation’s designs, the designers re-evaluated and reworked the prototype, removing systems that did not perform well during testing and replacing them with either modern components or proven alternative versions taken from some of their other designs that hadn't tested well despite the improved systems. This included swapping out the advanced high-performance engines which had been one of several costly components which had led design's downfall, and replacing them with retooled variants taken from the Nero series. In addition to this they removed the unique and expensive weapons that had been designed for use by the design, and refitted it to instead be compatible with the most of the currently available weapon systems. Their aim was to create a new template for the machine conceptualized by the administration when it had initially approached them looking for a new modular mobile weapon by creating a cut-down version of their previous design, while at the same time preserving the vision which had inspired it in the first place. While this was going on however, they also found a new use for the modularity of the prototype. In spite of having been passed over in favor of a lesser machine, the Kitsune would end up finding a new niche as a test bed for concepts that would end up appearing in later designs. Its easily reconfigurable nature made it a natural choice for this, as opposed to building expensive prototypes that would prove impractical once the funds had been wasted. Most notable of these instances were the module that became Back Weapons System for the ReGZ and a unit that would later become the backpack storage system for the Fin Funnels on the Hi-Nu Gundam. Following the founding of the Strategic Naval Research Institute (SNRI) in the wake of the Second Neo Zeon War, several of the suit's chief designers were co-opted by the organization. Even going so far as to take their research data with them so that they could continue their work alongside a fresh set of minds. The administration of Anaheim however would not let them take the actual prototypes with them however, instead logging the two units as being put into storage while in reality turning the frames over to the Vist Foundation for their own use. Once in the hands of the Foundation, one of the prototypes was renamed Kumiho, after the Korean variety of the same spirit which had been the namesake of the original design, and was disguised in order to hide its origins with Anaheim. It was then refitted with technology taken from the top secret UC Project in order to compete with the upgrades and alterations being made to the SNRI variant. Lacking the hardware miniaturization and compact reactor technology that was slowly becoming their competitor's trademark, the engineers at Vist decided to take the design in a new direction by instead incorporating a full psychoframe based chassis into the design to increase performance and responsiveness, much like the ones that would also be used in the Sinanju-series and Unicorn Gundam. This would be further supplemented by the addition of several additional maneuvering verniers and flexible control surfaces along the unit's limbs and shoulder armor. In addition, the tonnage allotted to the suit's armor was decreased by a margin of 50%, and the material replaced with the lighter weight Gundarium Gamma in order to offset the reduction in defense created by the adjustment. This was further supplemented by adding a layer of anti-beam coating to the frame's exterior in order to increase survivability versus the mainstay weapons of the era. The final result was a machine that was much more responsive and slightly better defended then its Federation counterpart, while at the same time maintaining the basic modularity that had made the suit's design so popular in the first place. The new armor materials, in addition to the enhanced maneuvering systems, and the addition of a full psychoframe brought the suit's agility ratings and response times up into a similar ranking with other high-performance units like the Sinanju-series. 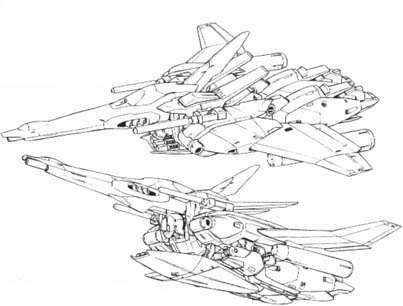 This would become even more the case with the redesign of the original Kitsune's subflight unit, which was retooled using the Sinanju Stein as a base in order to take full advantage of the lighter weight afforded to the refitted design. So far this refit has only been made to one of the prototypes, the second unit having been disassembled for further analysis and experimentation by the Vist Foundation. The biggest problem with most CIWS is the lack of space for cramming in ammunition due to tonnage requirements for other more important systems. Realizing that spacing was somewhat less of a problem for the original Kitsune due to the extra tonnage afforded the design by its modular nature, the designers at Anaheim came up with a new dual-feed type magazine capable of holding two separate types of ammunition within the space provided, which the pilot could access with the flip of a switch on their HOTAS. While each individual magazine is only capable of holding about 60% of what is considered the standard capacity for the 60mm CIWS, the combined ammunition count of the two storage system components used together actually puts it at about 20% above what is normally carried by the normal system currently employed across the board. Meaning that the Kitsune and its sister unit the Kumiho actually enjoy a slight edge in total ammunition over its mass production counterparts. The typical payload for this system is to have the primary magazine loaded out with the normal armor piercing ammunition utilized by the Federation forces and the secondary one loaded with either high-explosive or a type of scattershot/fragmentation round for use against missiles and other area based targets. One of the earliest innovations in the theory of modular mecha design, the limb equipment pods were first utilized by the Zaku series during the One Year War. Since then they have made numerous appearances, including the newest incarnation used on the Jesta Cannon. In the case of the Kitsune, they are meant to provide supplementary weapons and fuel to enhance the effectiveness of the various equipment packs. Currently there are two types for use with the arms, and two for use on the legs. The arm units come as either a basic 2-tube grenade launcher, inspired by the ones used by the Zeta Gundam. Or a single 90mm gatling based on the one used by the NT-1 “Alex” prototype from the One Year War. The legs can be equipped with either the traditional 3-tube missile pod, or an external propellant tank to provide additional operating time. As with all of the other equipment modules used by the Kitsune and Kumiho, these units can be ejected once they’ve been expended in order to decrease weight. Designed specifically for flight and mobility, the original Flight Unit was intended as a supplementary backpack module for the Kitsune. In space, the additional thrusters, verniers, and control surfaces make the Kitsune more maneuverable. On Earth, the pack allows the suit to make high jumps and attain sustained flight. Aside from the extra thrusters, the Flight pack adds two high-energy beam cannons to the Gundam's armaments. After falling into the hands of the Vist Foundation, the original design for the Flight pack was tossed out, instead being replaced by a newer variable geometry pod based design inspired by GP-01 "Full Vernian" and the "wings" used by the Sinanju-series. This new version removes the cannons from their mounting on the backpack, instead using a slightly simplified variation of the original mounting arms to affix them to the unit's hips, while at the same time redesigning them to be semi-collapsible in order to better distribute the pack's weight. This change allowed the designers to mount more powerful thrusters within the drive section of the module, in addition to redistributing their placement for maximum effectiveness in all environments. The final result being a design that proved far more agile, while at the same time only suffering from a 10% drop in maximum speed when compared to the original. The Heavy Weapon Unit is equipped for long range combat similar to the Full Armor RX-78, GM Sniper series, or the ZZ Gundam. Its main weapon is a high-energy mega launcher, which is powerful enough to blast through a space colony's wall. Additionally, the unit is equipped with a pair of weapon pods; one housing an 8-tube missile launcher and the other a 350mm rail gun. 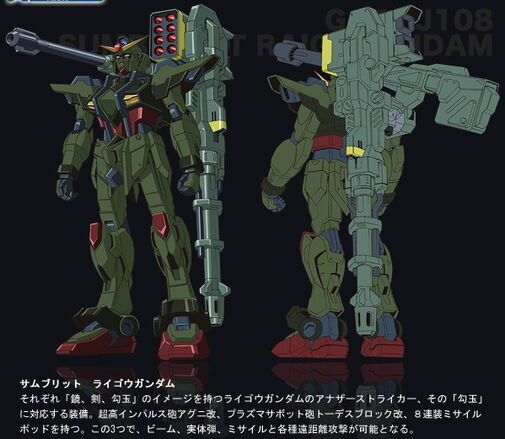 Developed for use with the Re-GZ, the Back Weapons System concept was an attempt from Anaheim Electronics to mass produce the MSZ-006R Zeta Plus R from the Gryps Conflict and the First Neo-Zeon War. The transformation mechanism was considered too costly to mass produce, and removed in favor of a special Back Weapon System (BWS), which the main suit was able to dock with to change to a Waverider-like form. Because the weapons of the unit cannot function when docked, the BWS is armed with additional beam weapons and missile launchers. While made most famous by the suit seen during Char’s Rebellion, a variant of the BWS was tested on the original Kitsune, utilizing a specialized set of hydraulic hinges to fold onto the suit’s back when not in use. This in turn would later evolve into the integrated version used on the ReGZ Custom and ReZEL. Originally developed to test the feasibility and technology to be used in the backpack of the Hi-Nu Gundam, the Fin Funnel unit is a space module which is armed with eight independently controllable psycommu drones called Fin Funnels. Although they are technically "bits" and not "funnels" (since the fin funnels have their own onboard reactors for power), they are far more advanced than normal bits or funnels in that, in addition to serving as remote beam weapons, they can also be used in geometric formations to create a "beam barrier", offering a target 360 degrees of protection against most weapons fire. Unlike its Federation counterparts however, the Kumiho lacks the enhanced frame that made this version of the design practical for prolonged use in combat. 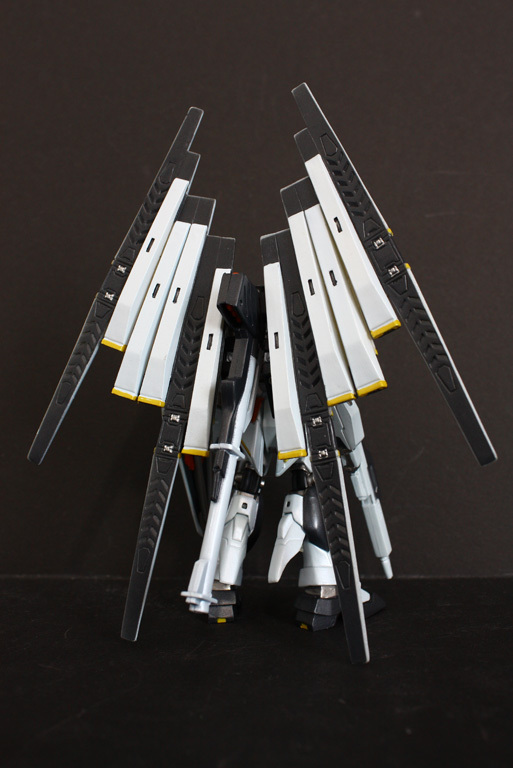 As a result the Hi-Nu version of the pack was scrapped in favor of a more traditional mounting style. The new version of the module carries a whopping twelve fin funnels instead of the original eight, but instead of putting them on variable geometry wing binders, mounts them in a simple backpack style rig placed behind both of the unit's shoulders. This in addition to the increased weight decreases the module's overall space mobility, but places far less strain on the frame when performing high-speed maneuvers, while at the same time dramatically reducing the number of moving parts that need to be maintained. I like the balancing of the units, how each has strengths and weaknesses compared to each other, and how some are explained by the unique technical capabilities of their manufacturers. It's very nice.